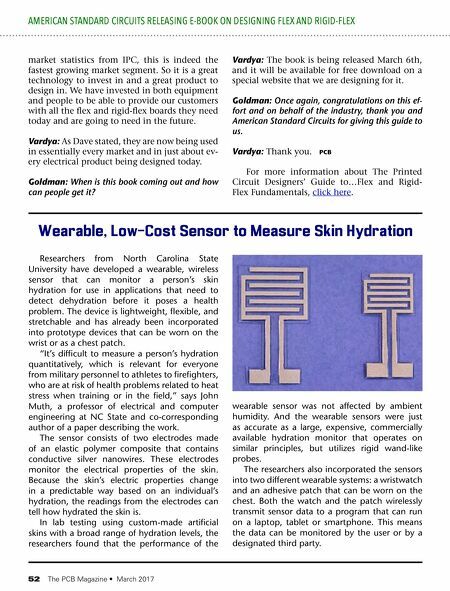 52 The PCB Magazine • March 2017 AMERICAN STANDARD CIRCUITS RELEASING E-BOOK ON DESIGNING FLEX AND RIGID-FLEX Researchers from North Carolina State University have developed a wearable, wireless sensor that can monitor a person's skin hydration for use in applications that need to detect dehydration before it poses a health problem. The device is lightweight, flexible, and stretchable and has already been incorporated into prototype devices that can be worn on the wrist or as a chest patch. "It's difficult to measure a person's hydration quantitatively, which is relevant for everyone from military personnel to athletes to firefighters, who are at risk of health problems related to heat stress when training or in the field," says John Muth, a professor of electrical and computer engineering at NC State and co-corresponding author of a paper describing the work. The sensor consists of two electrodes made of an elastic polymer composite that contains conductive silver nanowires. These electrodes monitor the electrical properties of the skin. Because the skin's electric properties change in a predictable way based on an individual's hydration, the readings from the electrodes can tell how hydrated the skin is. In lab testing using custom-made artificial skins with a broad range of hydration levels, the researchers found that the performance of the wearable sensor was not affected by ambient humidity. And the wearable sensors were just as accurate as a large, expensive, commercially available hydration monitor that operates on similar principles, but utilizes rigid wand-like probes. The researchers also incorporated the sensors into two different wearable systems: a wristwatch and an adhesive patch that can be worn on the chest. Both the watch and the patch wirelessly transmit sensor data to a program that can run on a laptop, tablet or smartphone. This means the data can be monitored by the user or by a designated third party. Wearable, Low-Cost Sensor to Measure Skin Hydration market statistics from IPC, this is indeed the fastest growing market segment. So it is a great technology to invest in and a great product to design in. We have invested in both equipment and people to be able to provide our customers with all the flex and rigid-flex boards they need today and are going to need in the future. Vardya: As Dave stated, they are now being used in essentially every market and in just about ev- ery electrical product being designed today. Goldman: When is this book coming out and how can people get it? Vardya: The book is being released March 6th, and it will be available for free download on a special website that we are designing for it. Goldman: Once again, congratulations on this ef- fort and on behalf of the industry, thank you and American Standard Circuits for giving this guide to us. Vardya: Thank you. 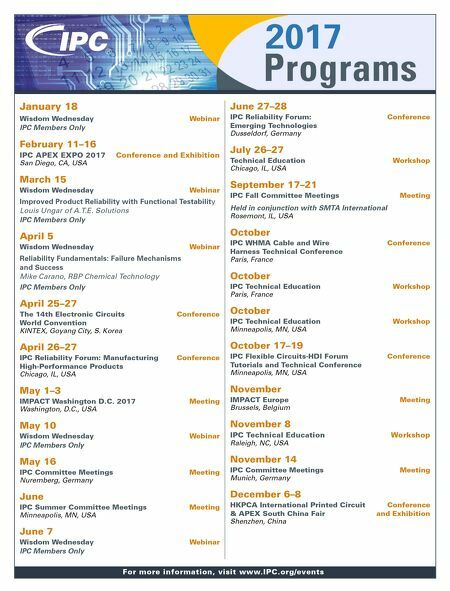 PCB For more information about The Printed Circuit Designers' Guide to…Flex and Rigid- Flex Fundamentals, click here.